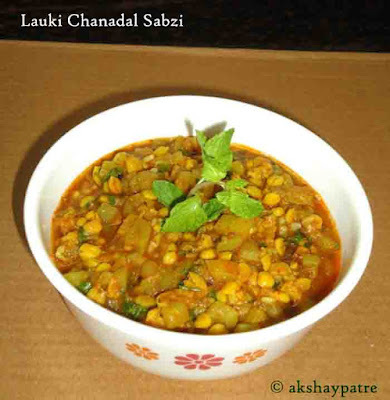 Lauki chana dal sabzi in pressure cooker recipe - Lauki chana dal sabzi is a simple and easy to prepare side dish for Indian flat breads. This sabzi doesn't need any grinding process. The best part is that it can be prepared in pressure cooker. Once you have tempered everything in the pressure cooker and take a few whistles, delicious side dish will be ready to serve. I often make it to serve with parathas, chapatis, jowar roti, bajra roti, rice flour roti, finger millet roti etc. This is a hassle free sabzi which can be prepared quickly. By following the below given easy steps, the lauki and chana dal in combination with mild spices make a delicious sabzi. 1/2 tsp asafoetida / hing powder. Rinse and soak the chana dal for about 5 hours. Drain water and set aside. Wash and peel the bottle gourd. Cut into small pieces and set aside. Heat oil in a pressure cooker. Add the mustard seeds. When they crackle, add the cumin seeds and asafoetida powder. Saute until aromatic. Add the bengal gram dal and bottle gourd pieces. Add the chilli powder, turmeric powder, coriander powder, jeera powder, garam masala and salt. Saute for 2 minutes. Add a cup of water and cover the cooker with lid. Take two whistles and switch off the flame. When the pressure releases, remove the lid. Add chopped coriander leaves and mix well. Serve lauki chana dal sabzi hot with parathas, chapatis, jowar roti, bajra roti, rice flour roti, finger millet roti etc. 1. Rinse and soak the chana dal for about 5 hours. Drain water and set aside. 2. Wash and peel the bottle gourd. Cut into small pieces and set aside. Heat oil in a pressure cooker and make a tempering with mustard seeds, cumin seeds and hing. 3. Add the bengal gram dal and bottle gourd pieces. 4. Add the chilli powder, turmeric powder, coriander powder, jeera powder, garam masala and salt. Saute for 2 minutes. 5. Add a cup of water and cover the cooker with lid. Take two whistles and switch off the flame. When the pressure releases, remove the lid. 6. Add chopped coriander leaves and mix well. 7. Serve lauki chana dal sabzi hot with parathas, chapatis, jowar roti, bajre ki roti, rice flour roti, finger millet roti etc. yummy channa dal and lauki..sabji..